A couple of weeks ago, Motor Man and I made a trip to the Outer Banks on a day that had started out sunny. But, during our visit, an afternoon storm approached. We saw 50 horses that day, including these five down by the water. This was the view to the west at that same time. Those were some dark clouds. This picture was taken of those same five horses less than ten minutes after I took the above photo. Conditions definitely “deteriorated”, and quickly. Lightning, thunder and pouring rain…..and those horses didn’t seem bothered at all. This video I took (with the car window down) will give you an idea of the storm. You can see the lightning, but the wind was so strong, I’m not sure you can hear the thunder. Although we’ve been on the beach in the rain, this was our first time being there during a thunderstorm. It was very impressive. But, soon, the sun was beginning to break through the clouds. And, on our way back, we stopped in the little village of Duck to watch the sun set. Once again, we found that a trip to the beach is never boring. In Wednesday’s post, I mentioned Renee and Mike. It seemed a bit odd to call them friends, since we had just met them briefly on the beach last summer while taking pictures of the wild horses. But sometimes, you just “click” with someone, and a friendship is quickly born. After the farewell party for Baby William at the Corolla Wild Horse Facility a couple of weeks ago, Renee and Mike continued on to the Outer Banks to begin their vacation. Motor Man and I returned home, but later in the week, made a quick trip to the beach to join our friends. 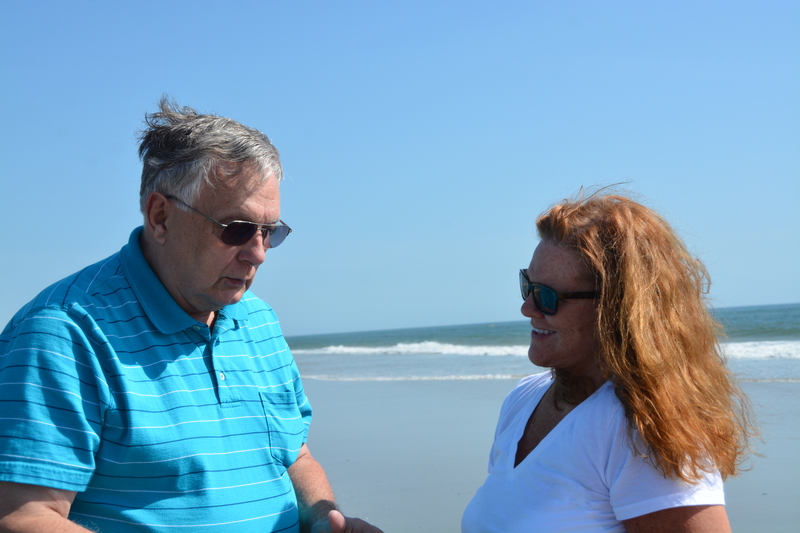 They’d vacationed in the area before, but had never extensively explored the beach in search of horses. We were on the beach at sunrise, our very favorite time of the day to be there. It requires early rising, but it is SO worth it. Shortly after picking up Renee and Mike for their tour, we hit the lottery. One of Renee’s wishes was to see Baby North Star, so far the only Corolla foal born this spring. And, sure enough, we saw her with her family, down by the ocean. This tour company aims to please: here’s your photo op with Baby North Star, folks. And I managed to get this one of North Star with the dune as a backdrop. It almost appears that she’s standing in front of wallpaper. After a morning of finding and photographing horse, we introduced Renee and Mike to one of our favorite lunch spots: Cap’n Franks. (Their treat: thanks again!) Afterward, we posed for a picture along with their two sweet canine family members, Bodhi and Beemer. Renee and Mike are just proof that a friendship can come about in an instant. And those wild Corolla horses are responsible for this one. Sunday, we had a full day of celebrating Mother’s Day. Sundae and Gypsy each gave me a hanging basket. (Yes, it’s true.) Motor Man and I went out to breakfast with Marshall, and his gift to me was a nautical door decoration. Motor Man and I then took his mom irises from our yard and treated her to lunch, a ride out in the country and an ice cream cone. By this time, it was nearly mid-afternoon, and I thought we we would be heading home. Wrong. I should know my husband better than that. 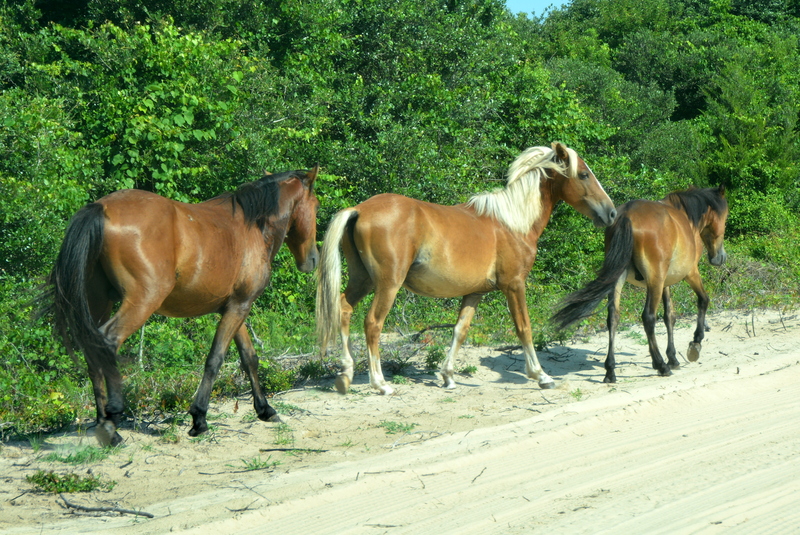 His gift to me was a whirlwind trip to the Outer Banks to see “my” wild horses. And, oh my goodness, did we see horses? Evidently they were all out enjoying the beautiful weather. First, we saw these four beauties enjoying a meal up on one of the steepest dunes at the beach. They were having a difficult time keeping their footing. I never tire of scenes like this. Seeing the horses down by the water’s edge is always a treat. It isn’t often that we get to see the horses running, but that was the case on the other side of the dunes. 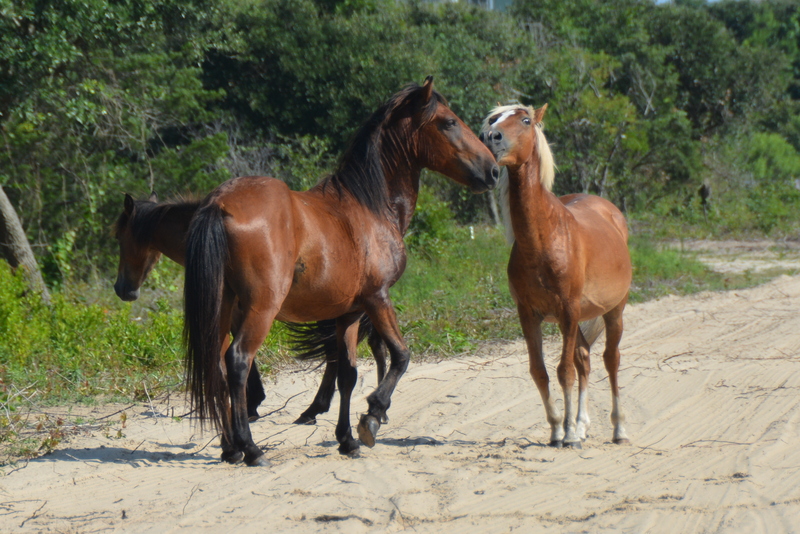 It was a perfect Mother’s Day: time spent with family, followed by a trip to see “my” beautiful horses on the beach. I am one fortunate girl. *CORRECTION: I have now learned that the black stallion was NOT Gus. I will be also be sharing a correction on my next blog post. Some weekends are just more action-packed than others. And this past weekend was definitely one of those for us. 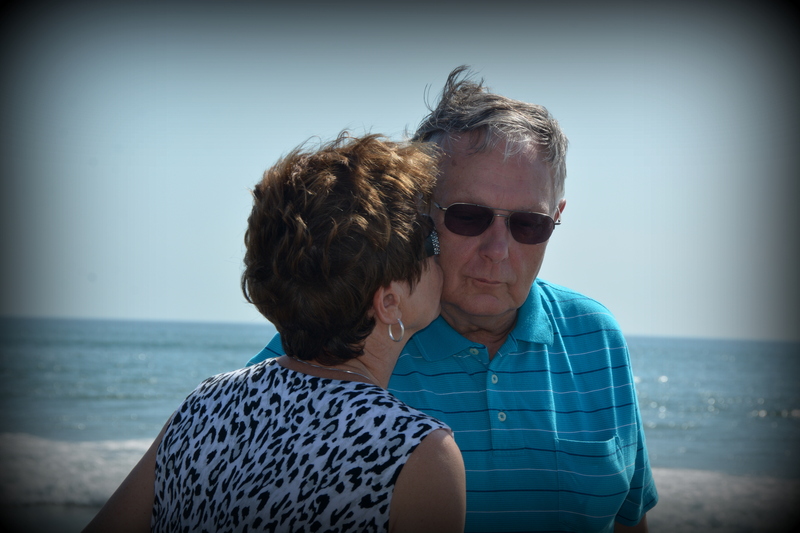 Thursday morning, Motor Man, my friend, Donna, and I went to the Outer Banks. We did a little shopping, had lunch, more shopping, had dinner and stayed the night. 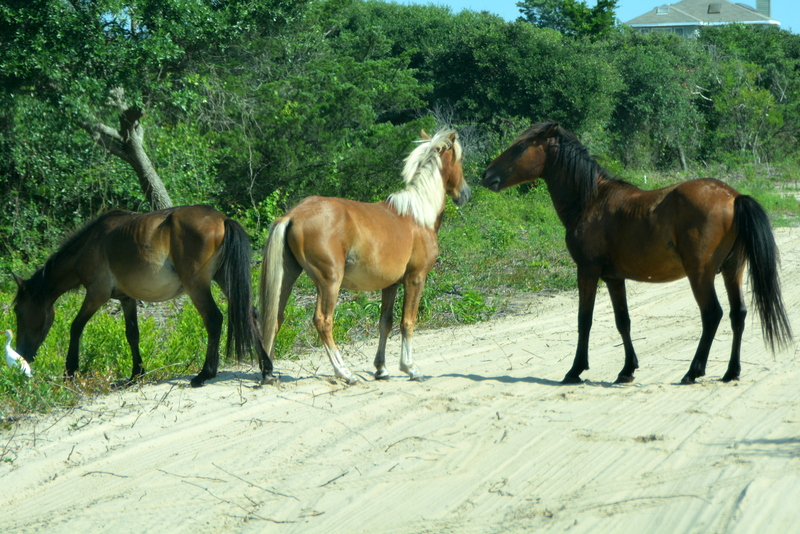 Early Friday morning, we were up and on our way to Corolla in search of wild horses. 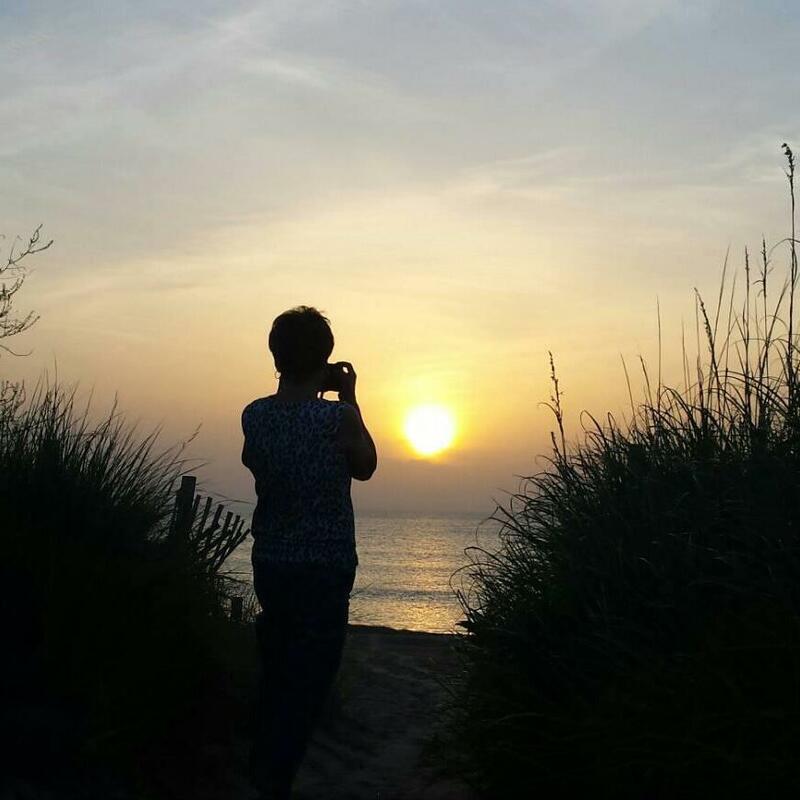 But first, we stopped to catch the sunrise, and Donna took this photo. (Sorry for the rerun, Facebook friends.) When she looked at the preview on her camera, she was so excited. And I think it’s special, too. We could tell by the horses’ body language that things were a bit tense. We soon realized that these were two stallions, and we had our cameras ready for a serious “discussion”. But, discussion was apparently all there was to be this particular time, and the guys walked away rather peacefully. 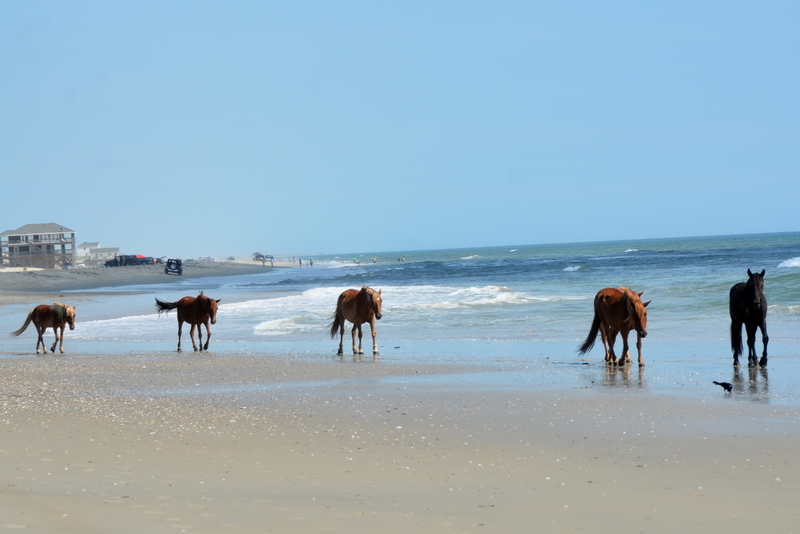 It’s always a treat to see horses on the beach near the ocean, preferably walking IN the water, and these five obliged us. 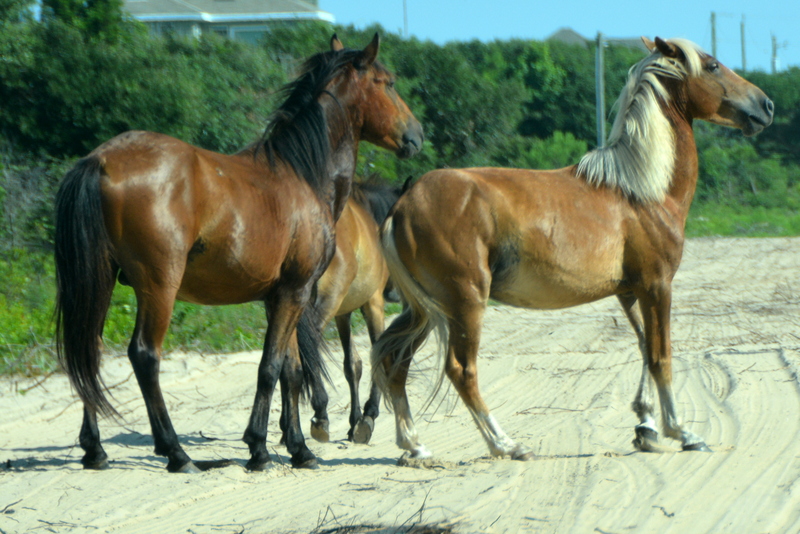 It was a perfect day on the beach: comfortable temps, a nice breeze, sunshine, wild horses. During one of our stops, Motor Man shared a joke with Donna by the seaside. Thanks, Motor Man for putting up with all our girly silliness, giggles, shopping, etc. On Wednesday, I’ll share part two of our busy weekend. * As always, we were always more than the required 50 feet distance from the horses. My photos were taken with a zoom lens, and most of them have been cropped to bring the images in closer than the distance they actually were.